I am finally getting around to posting on our front walkway and stairs. I had to dig deep in the archives to find some of the before pictures and I'm almost too tired to even write about it after seeing all the work we had to do. The walkway and stairs are made of concrete pavers. They come in irregular sizes (length wise) to simulate old stones. We used these same pavers on our outdoor dining patio and stairs. This is the view of the valley below with Mt. Adams in the background. Putting in the hardscape was definitely an huge undertaking. I personally had no idea that there was so much involved in creating features as simple as walkways. We started with this, a few concrete stones and some old wood beams. This was our fancy front steps and walkway for about a year after we renovated the house (this photo was taken in 2009). After much deliberation, and some math on Mike's part, we decided to create the stairs with concrete and then adhere pavers over the concrete to create a stone look. 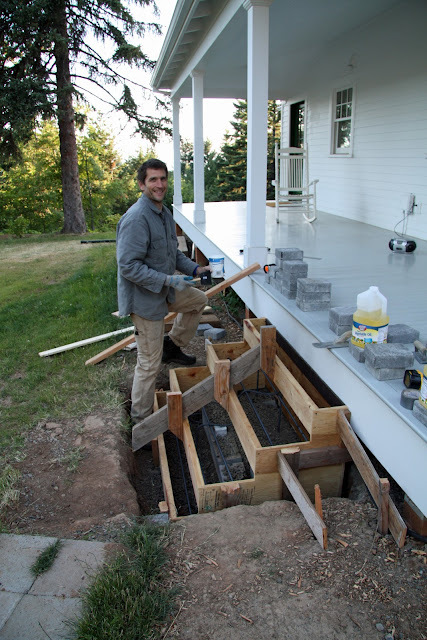 Mike started building the stairs by creating a form for the concrete. 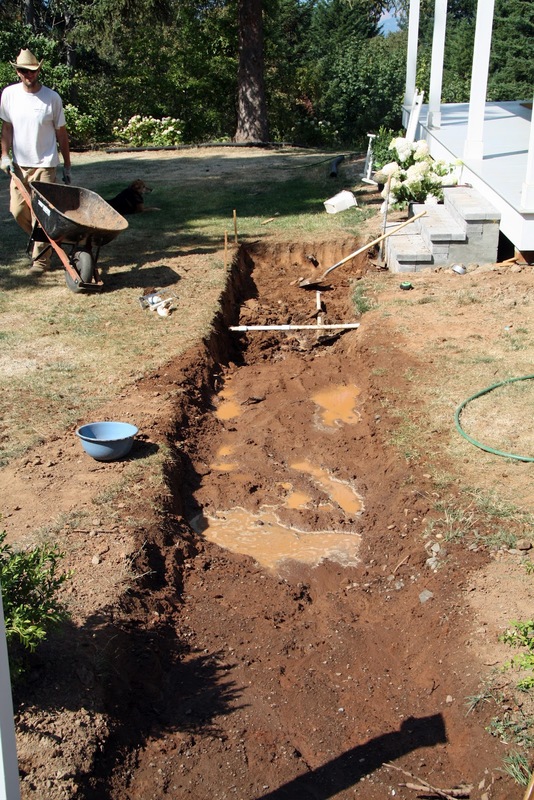 This was a lot of work as he had to dig down fairly deep into clay soil so that the stairs had a firm concrete base. After the concrete was poured and cured, Mike adhered the pavers to create the look of stone steps. 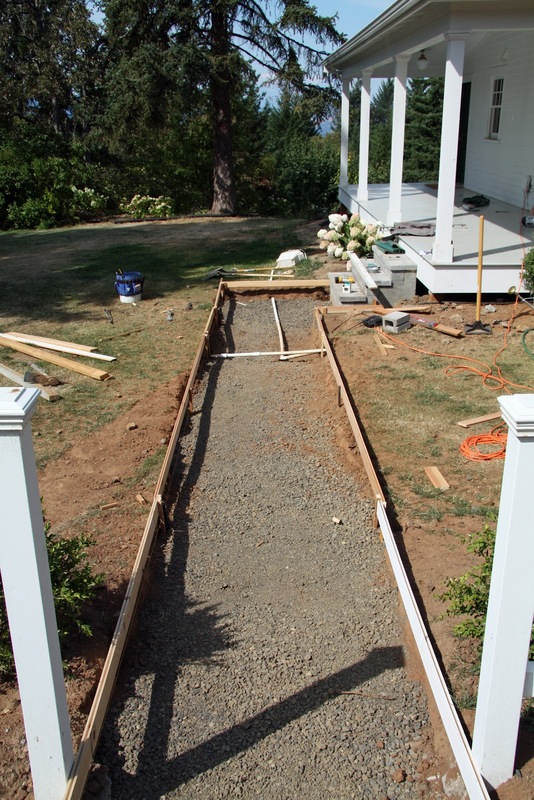 As we completed the stairs, it was time to build the walkway. This involved a lot more digging into our clay soil which is like concrete when it is dry, and softens a couple inches at a time with lots of water applied to it. So this was a fair amount of hard work. I know because I attempted to help out, but gave up when I couldn't even get the shovel two inches into the ground. I can assure you that Mike is always thrilled when I run to get my camera. 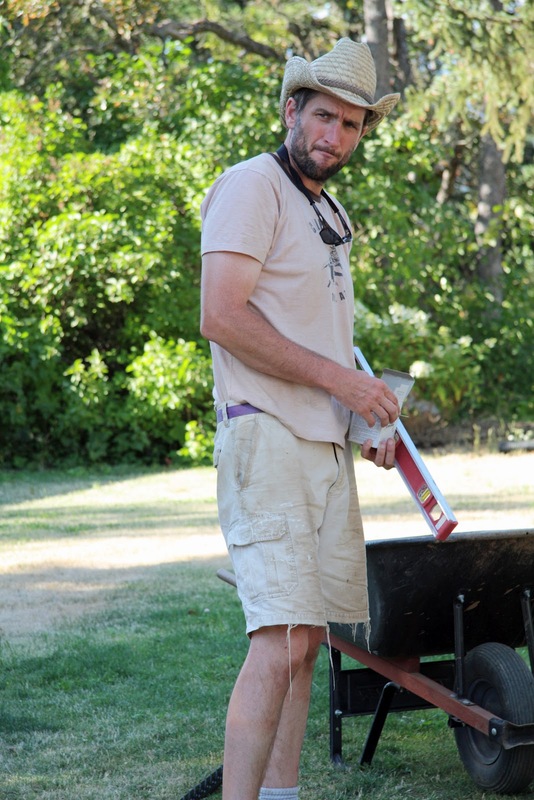 He's especially thrilled when I ask him to stop working and smile! This is a request he kindly ignores. The walkway took some fancy figuring to get right. The ground slopes downward slightly at a few pitches and due to varying elevations, there were water drainage issues to consider. We rented this machine a couple of times in order to get the gravel that is placed over the soil compacted and level for the pavers. 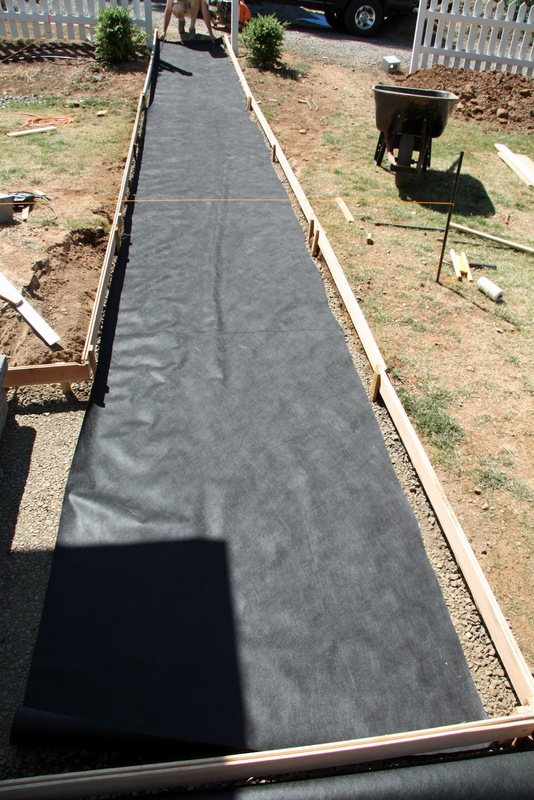 Here is the stabilization cloth that goes over the gravel. 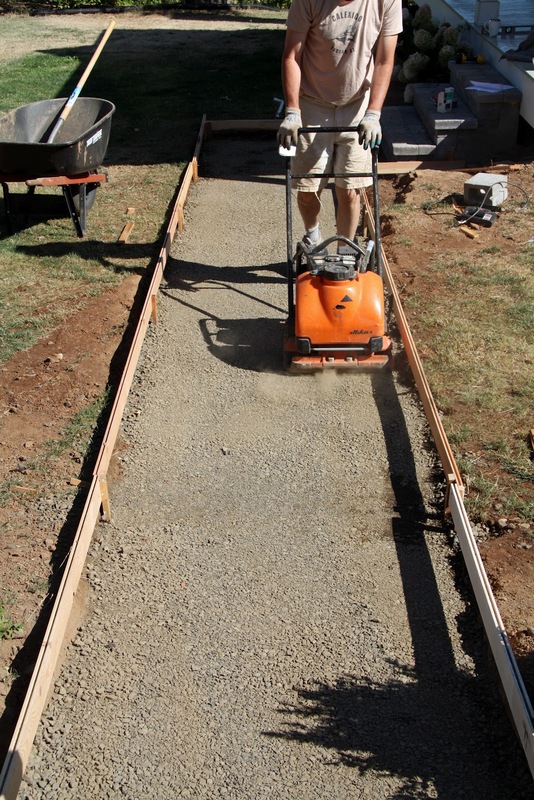 By the way, this was Mike's first time putting in a walkway so this is all information he learned from books and online resources. The picket fence was also an ongoing project during that same summer. As you can see, Mike left a section of the fence open until we finished the walkway so that he could access the area more easily. So much math! 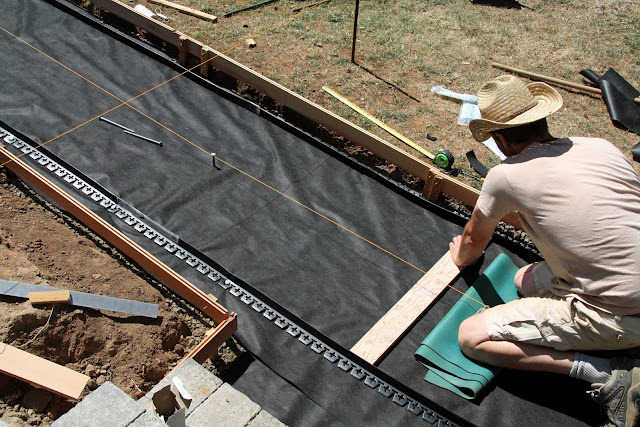 Here Mike is using a guide to set the edge pieces which help hold the pavers in place when you walk on them over the years. Next up was a layer of sand, over which the pavers were placed. More sand swept over the top filled the cracks between the pavers. The last step was to run the compactor back over the walk to lock everything in place. And voila! This is what Mike looks like when he's thinking about some of the details. I don't know how he gets up and goes to work every day after all this! He has certainly created a beautiful home with you. Wow! I'm so impressed with your husband's abilities! The walkway and steps look amazing. Gorgeous!!! And the views from your house are just beautiful. Wow! Wow! Wow! The final result, the views and the back breaking labor! Wow! Beautiful! 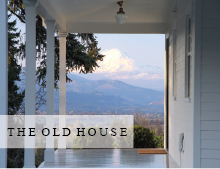 What did you use on the porch? High gloss paint? Epoxy? Something else? It all looks great. What a terrific view! It's really breathtaking. I love the steps and sidewalk and appreciate the tutorial. What a transformation! That looks so beautiful, I love the pavers!! "For better, for worse" and you seriously have a ton of "better" which I love! I think Mike has a lot of the "better" too - even when he is in the midst of those details! You sure have given a whole lot of better to your home. Love it - absolutley fabulous job on that walkway, stairs and holy moly that view is just postcard perfect - what an amazing home have ye!! Your hubby is gorgeous and very good at diy! The view from your garden takes my breath away every time you put in a picture of it. So lovely! The house is perfect and the view is wonderful. Thanks for your great posts. What a view! Amazing. The walkway is perfect. And yes, it is a challenge laying stone pavers. We have a patio out back that we created with them. There is a lot of steps to the process. What a lovely walk! I love the character it adds to your home! Good work, Mike! The walk way turned out great. Love the view. we've been contemplating possibly laying a pathway like this for a couple years. can't argue with the results. It looks absolutely wonderful and like it will stand the test of time. thanks for sharing your photos of some of the process. Trina, that's alot of work. Rob would not want to do it. Your very blessed. It came out beautiful! I love the photos of the empty porch and it's view. It must be a peaceful place to sit and pray and loose yourself in thought. Everyone needs a place like that. Lovely Trina. What a sensational job Mike did! And that view is gorgeous!! Your house is lovely! And what a view!! My grandfather was a civil engineer- he'd have the same look on his face whenever he was thinking about details, too. May I ask what the huge jug of Crisco oil was used for? 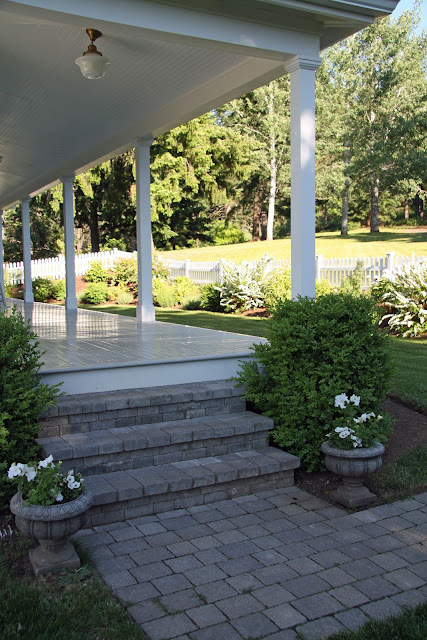 It is on the porch in one of your photos pertaining to the steps. Lovely view. I'd be outside on that porch all day long. surreal view...like a Maxfield Parrish painting. Go Mike, looks beautiful! The view you have is just amazing! Plus all that you have accomplished together at this home is just as amazing. 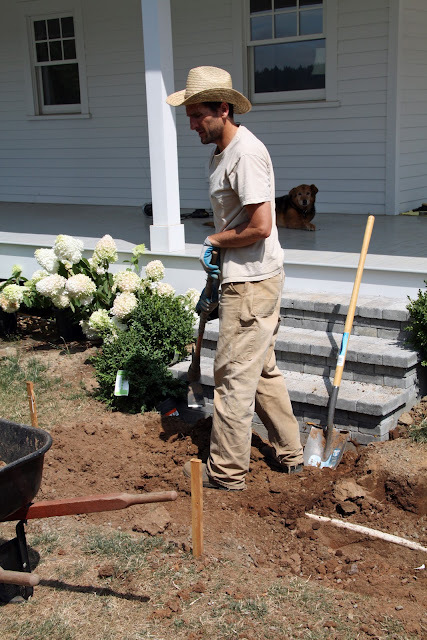 this landscaper knows what mike went through, NOT EASY! actually trina everything about your landscape is quite lovely and those VIEWS! It was for the fresh concrete I think...I can't remember. But we didn't use it in the end. In fact, I think we still have that big tub of Crisco in the basement! It's Porch and Floor paint by Benjamin Moore. Don'tcha just love a DIY kind of man? Excellent job! My hubbs gives me a similar kind of look but it usually means--Get that dang camera out of here! I love the walkway. . . Mike appears perfecto in constructing his projects. Are the little ones walking on the walkway yet? What I can see of it, and the great view! The wakway and steps look absolutely fabulous! Thanks for posting this. 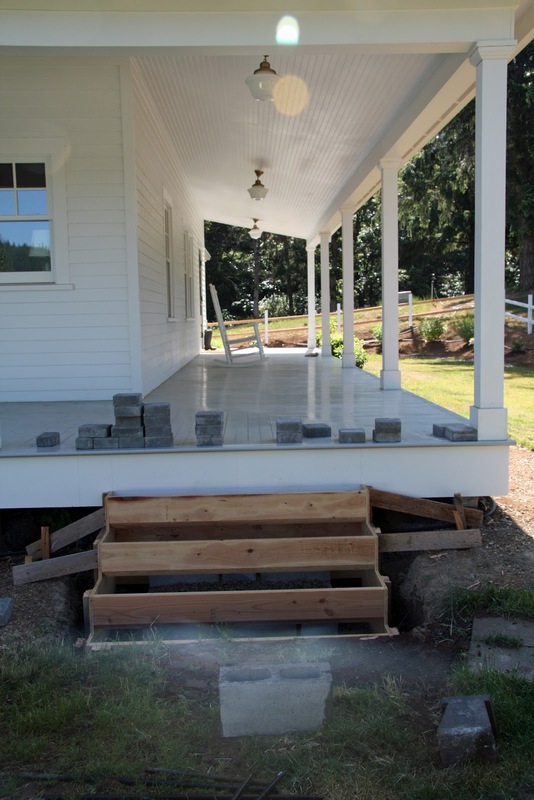 We so need a new walkway for our farmhouse. Helpful to see the steps and one that is done. Well done! Your handyman is adorable! The stone steps and walk are just what the house called for...beautiful! Just amazing... you two could be on a tv show for home decorating or renovation. I still love your blog. I can't get enough of these before and after photos. You have done a spectacular job and I love seeing all the hard work that went into it. Even my 9 yr old daughter loves looking at the progress you made. We ooh and ahh over the photos together. Good ole' Mike....you gotta love him....sniff, sniff...thanks Trina. PS I am going to email your post to my husband to show him (give him an idea) what you and Mike have done with your path. I don't often comment, although I always read your posts (you're on my sidebar). Thank you for sharing your life with us - it's heartening to know vibrant marriages and healthy families still exist. It is so beautiful. And as always I cannot get over that fabulous view. I am your newest follower! I actually found your home in Country Living! Handsome husband, willing to think, plan, create and continue to enhance your home and environment, topped off with a pair of the most beautiful babies...wow, gorgeous-ness all around, ALL around!!! Everything looks FANTASTIC...and, why not? Anytime a HOTIE works on things, they are BOUND to turn out great. 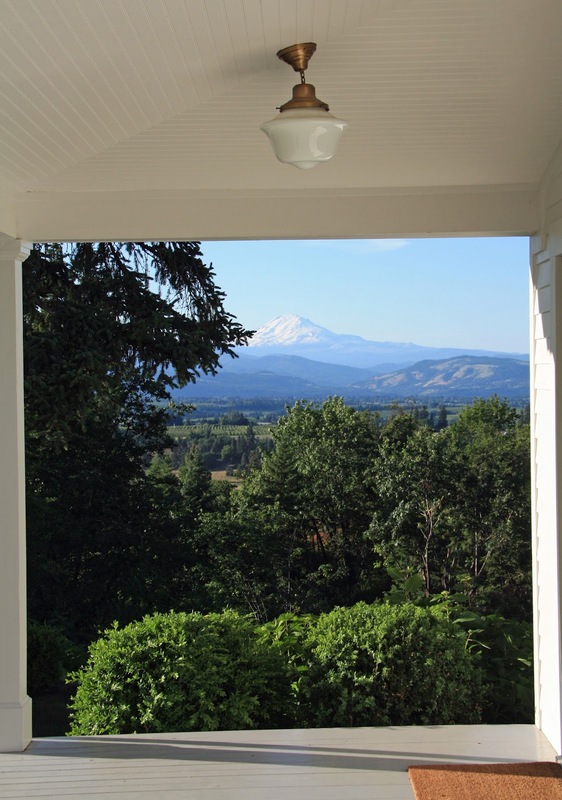 Oh the view from your porch is so amazing!! Your husband is really blessed to be so talented. All of his hard work looks awesome! Handsome husband willing to do the study, planning, hark work, beautiful property thanks to diligent hard work, two beautiful little babies...we, all, should be so fortunate. All reasons to celebrate a wonderful Father's Day! Happy Day, Mike! I love a handy man! I guess this is what you call sweat equity! It's looking wonderful and will serve you well for years...just like that view! What a view! Your house is beautiful! I love the walkway. What a lot of work. I laid our walkways and patio with old brick but didn't do all the prep work necessary. Therefore, we have weeds and grass always coming up between the bricks. I need to add Quickcrete in the cracks do keep that from happening. Anyway, good work! Never mind all that yard work! Did you see that view????? Love the pavers and the way you put the white fence. 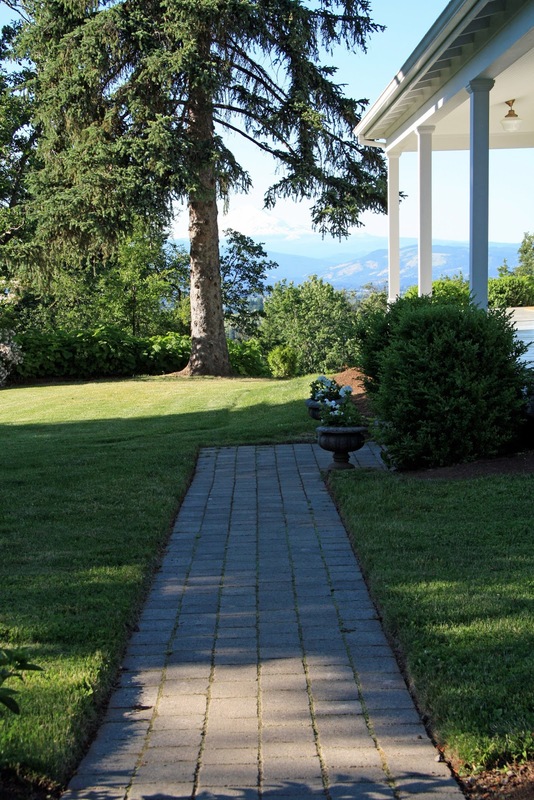 Love your walkway and porch and your view is breathtaking! Beautiful job! Oh dear. I was afraid that might happen. They've already changed the picture! Now he's at the bottom. Scroll down and you'll find him on the left under Related Posts. Your home is absolutely stunning! I moved from the city to the suburbs and the next step is straight into the country. You just cannot beat the beauty of the country and your home is such a great example of beautiful country living! 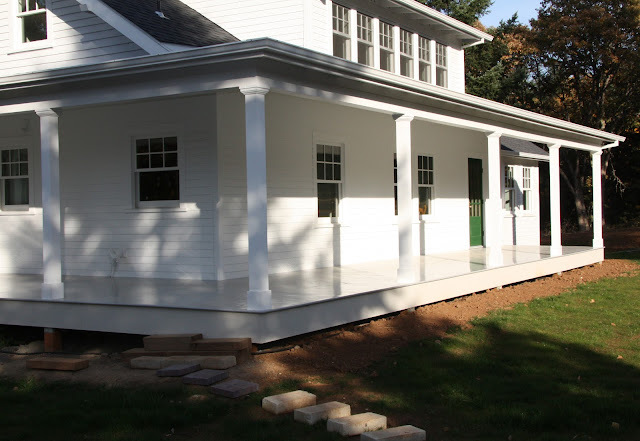 The house is already amazing enough, and now, the outdoor spaces just make it even BETTER! Awesome job. That mountain view is breathtaking. You are so lucky to have that view, that beautiful home, and your beautiful family. Not lucky, but blessed. Yes, you are blessed. Thank you for giving us a peek. What a view you have Trina and what a fantastic house you are building. Love the red Peonies and the delicate pink ones. I LOVE your posts!!! AMAZING transformation - I, too have been working on a "fixer-upper" - but nothing like the work you two have done. Huge congrats! Holy cow, your husband is amazing! The finished walkway is beautiful. 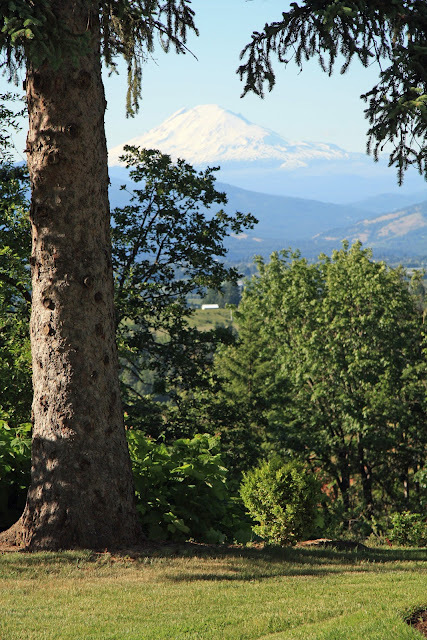 I love the view of Mt Adams. Lucky lady you are to have your children grow up in such a beautiful spot. Holy shizballs! Your husband is a dead-set DIY legend. That path and the stairs are fabulous! Truly! Hurrah for Mike!